Me-view in ProofHub gives you the personal space where you get to see all the upcoming events, overdue tasks and milestones that are assigned only to you. To help you better plan your work, our personal task management software gives you a dedicated space in the form of Me-view where you will get to see all your current, upcoming and overdue tasks, events and milestones at one place. With Me-view in our personal task management software, you don’t have to jump into different tasks lists to check the tasks that have been assigned to you. 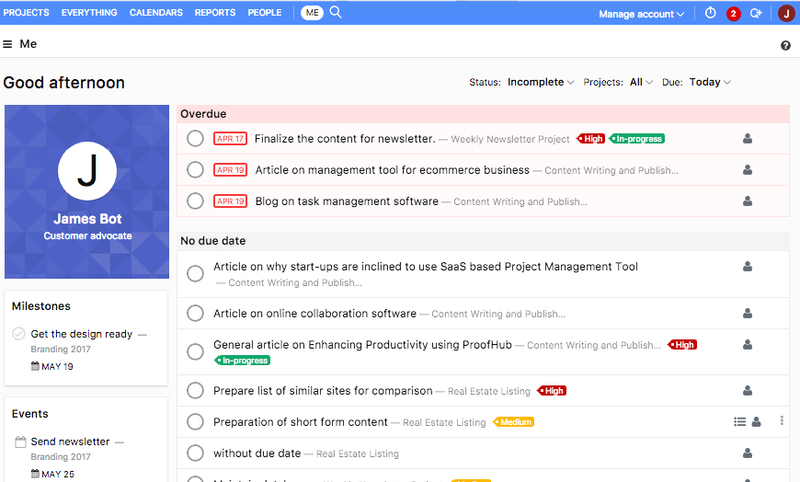 Simply open the Me-view and see all your current, upcoming and overdue tasks, to plan your work easily. Our personal task management software brings information about all the events across all your projects at a central place with Me-view. So, you can keep an eye on all project activities, always stay on top of project deliverables and deadlines. Me-view helps you in staying updated on all the important dates and deadlines. There’s no need to juggle between different projects for keeping an eye on milestones related to the projects which you are a part of. Tired of missing out on important project activities and juggling across different screens? Me-view is just the thing you need.